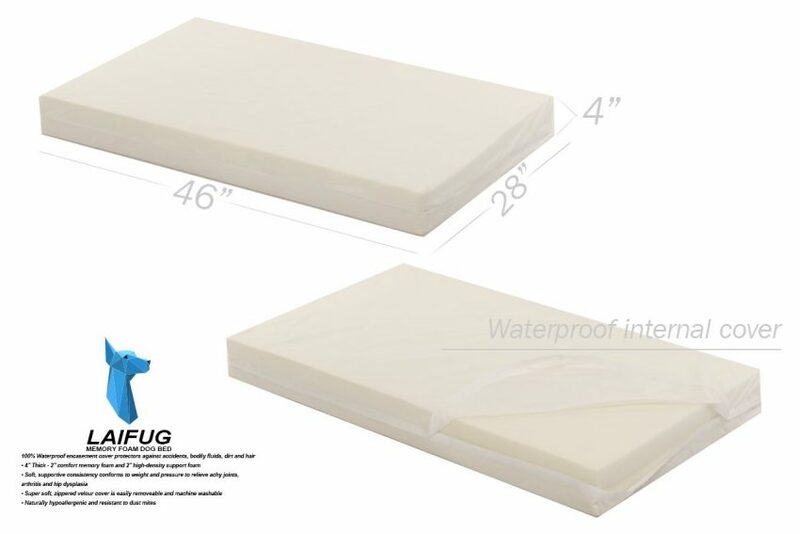 If you’re looking for a good budget-friendly pet bed, check out our complete LaiFug Orthopedic Memory Foam Dog Bed review to see if it’s the right fit (literally and figuratively). As you may know by now, I’m always on the hunt for the best dog beds to buy for my two pups. I have strict standards and requirements, as I’m a rather doting dog mom to my girls! I’ve mentioned the LaiFug in some of our other dog bed roundups, so I thought it was time to share a complete review! Read on to learn more about this orthopedic bed and find out if it’s right for your dog. 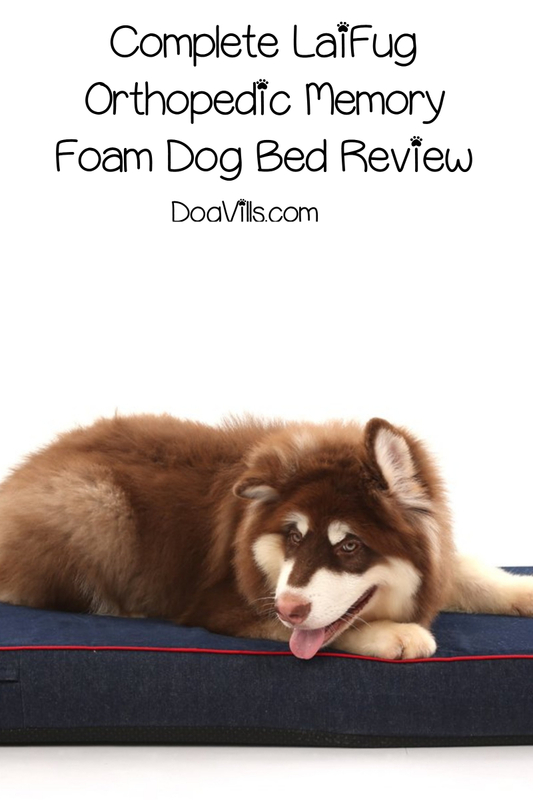 Let’s talk a bit about the features, pros and cons of the LaiFug Orthopedic Memory Foam Dog Bed, then I’ll go over some questions to ask yourself to decide if it’s right for your dog. This is just a quick rundown of the features. We’ll talk more about them in the next section. 4 inches of memory foam, including 2 inches of high density memory foam on top and a 2-inch foam base. High density foam helps support your dog’s pressure points and relieve the pressure on their joints. The removable cover is washable, making it easy to clean. Durable liner has a waterproof layer around the foam padding to protect against spills. Now that we have a good idea of what you’ll get, let’s look at how those features translate to pros and cons! When I look at memory foam dog beds, I want at least 4 inches of foam total, so this one meets my needs. The top layer is high-density foam, meaning it can support your dog’s weight without flattening while also conforming to their body. The memory foam is also certified to be free of harmful chemicals. If you have a puppy that hasn’t mastered potty training or an older dog with incontinence issues, you know a waterproof liner is a major pro. With a lot of dog beds, customers complain that the liners are never as waterproof as they say they are. That’s not the case here. For once, it’s truly a waterproof liner that will keep accidents from seeping through to the foam. 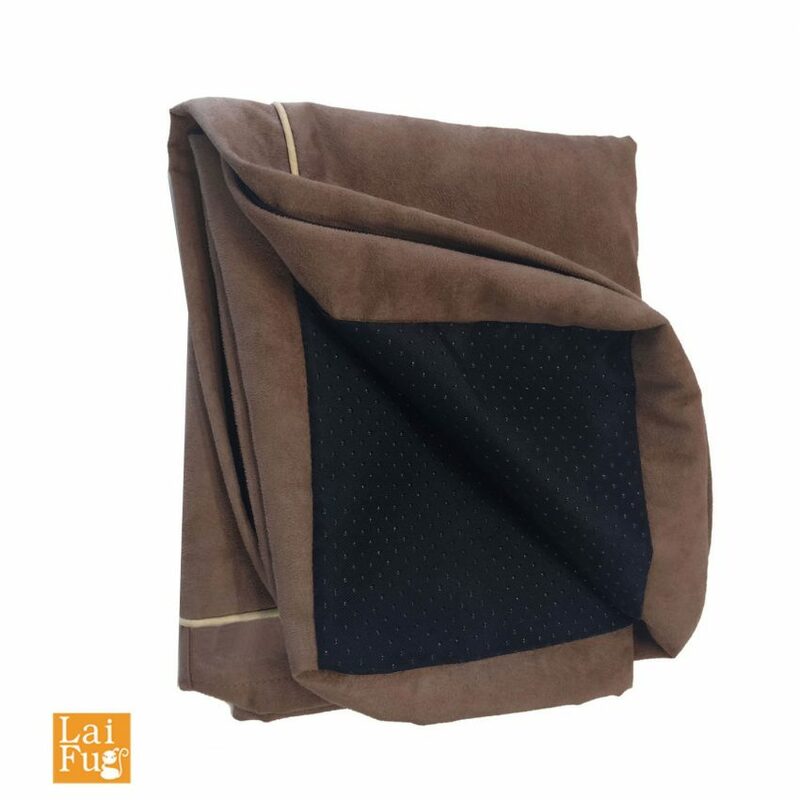 Perhaps the biggest pro, the Laifug is one of the most budget-friendly dog beds that we’ve ever covered. Even the large comes in well under $100. While the covers may not be all that durable (see below), replacements for it are reasonably priced at just over $25 for the large. I also like that because it means you can buy an extra cover to swap out when accidents happen and you’re not ready to do laundry quite yet. Like all beds (even my all-time favorites) there are some drawbacks to the LaiFug Orthopedic Memory Foam Dog Bed. The bed only comes in two sizes: medium and large. While the large is closer to the XL in other comparably designed beds, it’s still not big enough for a giant breed like the Great Dane. On the flip side of that, the medium may be more dog bed than you need for smaller breeds. While the waterproof liner is a pro for dogs prone to accidents, some customers complain that it’s too loud and “crunchy” sounding. If you plan to put the bed in your bedroom, that could get really annoying very quickly. Laifug doesn’t claim to be chew-proof (or even chew-resistant), so you can’t really fault them if your dog eats the bed. Still, it’s something to be aware of as you shop. If you have an aggressive chewer or digger, this is not the bed for you. You would be better off with one of these best dog beds for chewers. This is where that “reasonably priced covers” pro comes into play, because I’m hearing from many customers that the cover just isn’t all that durable. The zipper in particular seems very prone to breaking, and shipping it back to the manufacturer for a refund may cost more than a replacement cover. 1. How much bed do I need? Since this LaiFug bed only comes in two sizes, you’ll want to ask yourself this question first. Remember, just because the bed can hold up to 150lbs doesn’t mean it’s large enough for your dog. 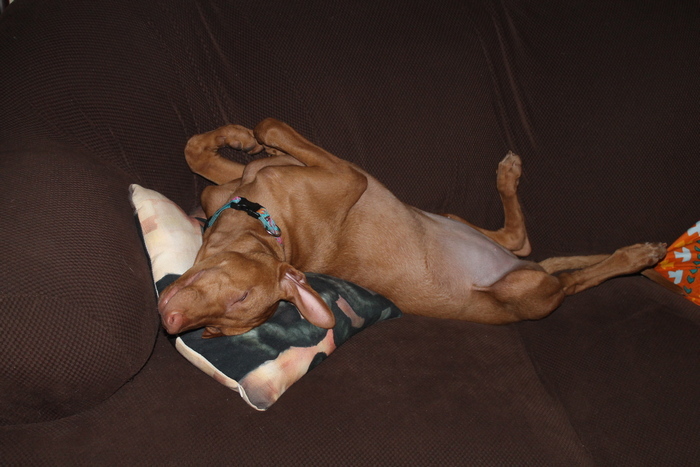 My Pharaoh Hound, Freya, is only about 65lbs, but she’s long and leggy, sleeps in weird positions, and moves around a lot. Even the large wouldn’t really work for her. She needs a roomier bed. This picture below was taken months before she reached her full size, but you can get a good idea of how she sleeps now! My lab/pit Mocha, on the other hand, weighs more than Freya, but sleeps curled up. She can actually get away with a much smaller bed than Freya. Again, on the other end of the size spectrum, if you have a toy breed, the medium may be too big. 2. Will it hold up against my dog’s habits? Does your dog chew? Dig? Move around a lot? Thunk down on a bed? Have a tendency to treat the bed as a toy? Freya does all of the above, so her dog bed needs to be super strong. Mocha doesn’t do any of those things, so I could put this bed in my room for her at night (she’s welcome to sleep on the bed, but prefers her nest on the floor). 3. Is it supportive enough? For younger adult dogs, the four inches of memory foam should be sufficiently supportive. However, it’s not the best dog bed for hip dysplasia or arthritis. 4. Where will I put it? Think about where you plan to put the bed and how it will look in that room. If you’re planning on putting it in your bedroom, remember that the liner is a bit crinkly sounding. If you’re planning to put it in your living room, ask yourself if you can live with the design, since you’ll be looking at it every day. 5. Will my dog like it? Perhaps the most important question of all, since nothing else matters if your dog won’t go near the bed! The LaiFug Orthopedic Memory Foam Dog Bed has a pretty “traditional” dog bed design, so I don’t see a major issue with most dogs using it. The LaiFug Orthopedic Memory Foam Dog Bed competes well with the big players, and of all the budget beds, it’s definitely one of my top 5 picks. Long story short, I think this LaiFug is a great buy for someone who needs a relatively inexpensive dog bed right away. Is it my all-time favorite? No. 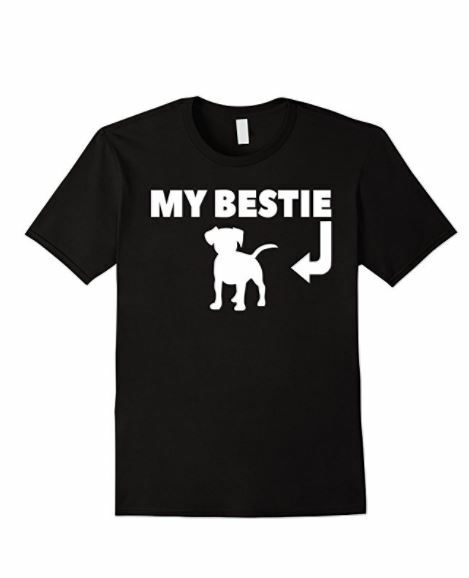 That would have to be the BuddyRest or the Big Barker (depending on the size of your dog). However, like many, I’m on a tight budget, so my favorite bed isn’t always the bed that I can actually afford! I’m glad to know that the LaiFug is a fantastic option that I can still feel good about giving my dogs. Do you have anything to add to my LaiFug Orthopedic Memory Foam Dog Bed review? Share below!